As most of you probably know I rarely do reviews of YA novels-I do some but not many! The author sent me the blurb and it immediately caught my attention--I wanted to read it! There is quite a bit of fantasy in this novel which will catch you off guard as it did me. I have to admit that I could not tell from which story each family originated--actually I am still not positive! This is definitely a book any young girl would be able to read (as would her Mom which I always suggest-Mom's read first then hand them over!). I really can't write too much about this without giving it all away--so I will leave you with this thought--What fairy tale family is your family descended? 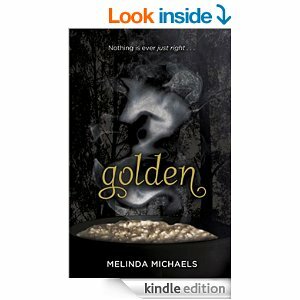 Golden is the first in a Young Adult magic realism, stand alone series and will be published by Reuts Publishing. The second book, Roses is complete while the third, Glass, is in the works. There will be five all together. Sounds like a pretty interesting book. Sounds like a fantasy/mysterious book huh?! Will keep this in mind for summer reading. Thanks for sharing. This sounds like a book that my daughter would be interested in. I would probably enjoy it too. This sounds like an interesting read. I wish I had more time to read books. I would check this one out. I love reading books like this. i am definitely going to have to try to make time to read this book this summer. I am definitely interested after reading a little bit about the book. This definitely sounds like a book I would not want to but down! Your review is leaving me wanting to read more! This sounds like an interesting book indeed. The review is amazing and has me interested for sure. Sometimes it is good to read fantasy. Thanks for sharing. Our eldest daughter will love this book. This is exactly the type of genre and style that she so readily devours. Of course I will read it first - and I bet it won't take me long because it sounds like so much fun! I've been reading more YA books as a sort of book club with my teen daughter. This sounds like one we would both enjoy. Thank you for the suggestion and review! I am always looking for new books to read. This one sounds like one I would finish fast, due to not being able to put it down. I'm definitely curious as to why those blackouts are occurring. This sounds like a really cool story! It does sound like a good summer read. My daughter has been reading books about descendants of fairy tale characters. This sounds like a good transition for her when she's done with that series. My YA reader will love this book. I will let her know that it is available. Sounds like a great summer read. Both my daughter and I love to read fantasy-themed books. Though she's probably not ready for YA books, I will give it a read at least for myself. Thanks for the review! This book sounds absolutely fantastic! I will have to get myself a copy and give it a read over the summer! Thanks! This kind of reminds me of the tv show Once Upon A Time. I think I would love this book, as would my girls. I just added it to my summer reading list! I have a special place in my heart for Young Adult literature. Some of my favorite books are in that genre! This one sounds super interesting. I might have to check it out. It's been awhile since I've read any YA lit, come to think of it. Thanks for sharing! We're about to head out on a cruise so we're looking for some good books to read. This sounds like a very interesting read. I have never heard of this author before today. I have to add this future books for my daughter to read when she is older. its the type of book she would enjoy. Sounds like an interesting plot, although the Amazon synopsis could have included more details, like descendants of who, to make it more juicy. Will have a look at the bookstore for this. Thanks! This seems like an interesting read. I'm recommending it to my Book Club - I have book club mates who are very much into YA stories. Great review, Miki! This sounds like a great read for the summer! I can see why you were intrigued - this book sounds like it would be a fun read. Would be a great book to read on vacation. This sounds like an interesting plot line. Hey, the more young adults like books the better for all of society as far as I'm concerned! Sounds like a good one! I rarely read YA but this does intrigue me! Books about memory loss almost always do. I like how they explore fairy tales and try to mix it up with modern times. This would be something worth reading especially for kids and teens. I enjoy reading YA novels. Thanks for the heads up on this one!